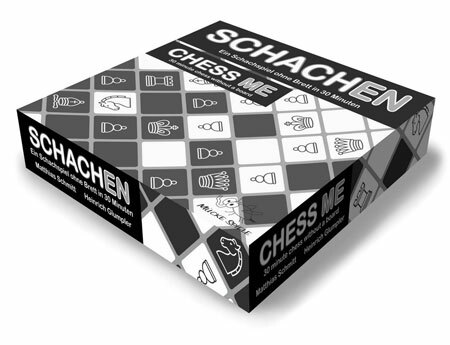 Schachen is a commercial chess variant from Germany. The game was invented by Heinrich Glumpler and Matthias Schmitt, and produced by Mücke Spiele. It was shown on the famous German game fair Spiel (always held in the German city Essen) in 2011. The game consists of a box with square cards; the cards show a (white or black) chess piece. The game is played with only these cards on any flat surface. A player starts with four pawns and his king. These cards are placed on the table as shown below. Each player has three cards of pieces of his color in his hand. 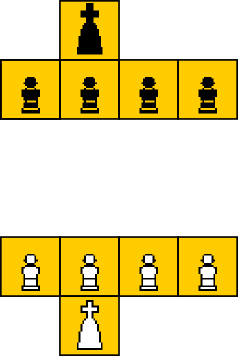 A move consists of first making a move following regular chess rules, and then placing a card from the hand on the table; pawns are placed next to pawns, and other pieces are placed directly behind a pawn. The game is won by mating the opponent. The English name of the game is Chess Me. The company producing the game has a website, dedicated to the game: www.schachen.net (German) or chessme-game.blogspot.com (English). I have seen prices for a set of the game ranging from 10.99 euro or 19.99 US dollars. Author: Hans L. Bodlaender. Inventor: Heinrich Gumpler and Matthias Schmitt.